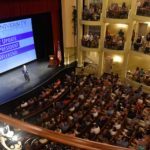 The university will continue its patriotic promise of pledging American flags to nonprofits, schools and government buildings. 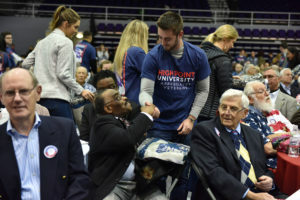 HIGH POINT, N.C., Oct. 24, 2018 – High Point University will honor hundreds of men and women who have served the nation during its annual Veterans Day Celebration. 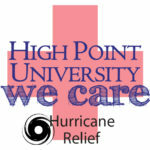 The event will be held at 8 a.m. on Nov. 9 in the James H. and Jesse E. Millis Athletic and Convocation Center on campus. 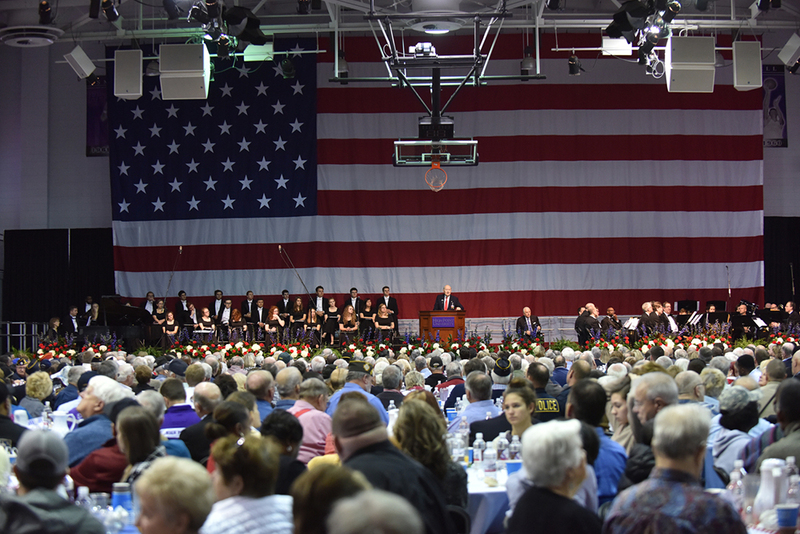 Student volunteers honored veterans at last year’s event with the gift of a blanket symbolizing the warmth and comfort they’ve brought to the lives of others. Veterans and the general public are invited to attend. To RSVP, visit www.highpoint.edu/VeteransDay or call the Campus Concierge at 336-841-4636. The program will include a complimentary breakfast and a patriotic salute. 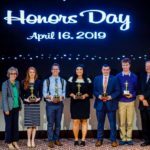 The university will continue its patriotic promise of pledging American flags to nonprofits, schools and government buildings and will recognize students leading initiatives to support veterans. Ryan Manion, who is president of the Travis Manion Foundation and who has dedicated her life to supporting the military and veterans, will speak at this year’s celebration. 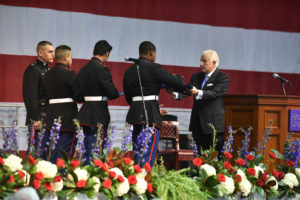 She leads a national organization inspired by the character, leadership and sacrifice of her brother, 1st Lt. Travis Manion, a U.S. Marine, in assisting families of the fallen in taking their next steps. 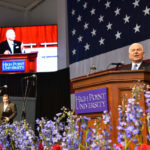 The event also will feature Dr. Nido Qubein, HPU president, and music from Nashville recording artist Stephanie Quayle, the North Carolina Brass Band and the HPU Chamber Singers.
) Last year, HPU donated 100 American flags to public schools, government buildings and community organizations in the city. Members of the High Point Central High School JROTC accepted flags that reflected the donation. All veterans and guests are encouraged to park at Oak Hollow Mall, 921 Eastchester Drive. Shuttles will begin running from the parking lot at 7:30 a.m. Along with this annual event, HPU is also hosting a documentary exhibit, “Serving Soldiers, Honoring Heroes,” in partnership with Patriot Rovers. On display Nov. 6-30 in the Norton Hall Gallery, the exhibit features photography by students from the School of Art and Design who worked with Patriot Rovers, a High Point nonprofit that trains service dogs for military veterans across the U.S. who suffer from post-traumatic stress disorder and traumatic brain injury. 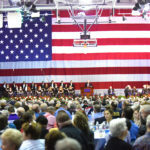 HPU’s celebration of veterans, which has grown significantly over the years, is supported by Ilderton Chrysler Dodge Jeep Ram, Scott A. Tilley, CFA, BB&T Scott and Stringfellow, River Landing at Sandy Ridge, and the Sheriff Family Veterans Awareness Endowment.